I don't like to brag but I did a happy dance around my living room when I read the email. 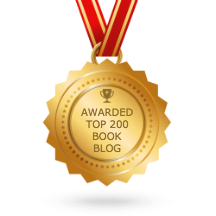 My blog is listed on FeedSpot in the top 200 book blogs. I'm currently listed at 100 which is kind of amazing. I've come a long way since I started blogging back in June of 2012. The Reading Diaries started when my husband suggested that I start a book blog because he was tired of me babbling about books. I wish he shared my book obsession but he doesn't yet. I keep hoping that one day it will rub off but after being together 10 years I don't see it happening. Looking at many more years of blogging. Be sure to check out the list (here) lots of great book blogs!! !